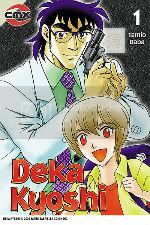 Detective Toyama is assigned to investigate the apparent suicide of an elementary school teacher. He goes undercover as a teacher himself and fills in for the victim’s class of fifth grade students. He is determined to find out if the suicide was just that, or if there was any foul play was involved that could put the kids in danger too. He quickly discovers Makoto, a strange boy who seems to be an outcast and bullied by his classmates. But it turns out that the reason why Makoto is so strange is because he has a special gift. He is able to look at people and see all their stresses and worries manifest into hideous demons and monsters. So with the help of the kind undercover detective, the two work together to fix the problems that plague these early adolescent students. While its “monster-of-the-week” episodic formula seems very simple and shallow on the surface, Deka Kyoshi turns out to be a very delightful read. First off, let’s talk about the art. In this American debut, manga artist Tomio Baba is able to recapture the retro look and feel of shonen manga from the 80′s. The faded coloring in the cover art, the eye shape of his characters designs, and the goofy facial expressions will be very reminiscent of reading the early works of Rumiko Takahashi and other shonen artists of that era. And yet this manga was first published in 2006. With the nice looking art comes a simple and sweet story that tackles the hardships of early adolescence. Every chapter focuses on one 5th grader in particular who is suffering from some problem not too far from the problems that children face in real life. The main boy, Makoto, has to suffer through bullying. One of his female classmate has had her body mature too quickly, so she faces an identity crisis on if she’s an adult or still a child. And another girl contemplates suicide because she believes she is the reason for her parents’ divorce. In each episode, Makoto is able to see his peer’s dilemma through the demonic images their stresses show themselves as. Because Toyama is able to step in as an authoritative figure being an adult, a teacher, and a detective, he is able to consult the child with the problem and ultimately find a way to fix it. While most of the time, the “fix” seems a little too simple and easy for such a dramatic problem, each chapter still leaves the reader with an uplifting and very positive message. What makes this story so delightful is that even with their flaws and problems, every child character has their own charm and innocent personality that will make you fall in love with them and their plight. Even the one adult character, Detective Toyama, becomes the comic relief that brings the much welcomed humor to the story. I can’t really call this a mystery series because its episodic format does take away from the main story of Toyama investigating the apparent suicide of the students’ former teacher. At times, you sort of forget that this is the reason why he is in this classroom in the first place. But little hints and clues that sporadically spring up do gradually progress that part of the plot, and by the time the final chapter ends, you have enough info to keep you interested in reading the next volume. I do have to take issue with CMX’s choice to rate this book “Teen Plus”, implying it’s one step below “Mature.” Yes, the monsters and demonic imagery are probably not for little kids, and the issue of suicide may also raise a red flag or two from conservative parental groups. But any way you look at it, Deka Kyoshi is a shonen comic about kids that is intended for kids, and therefore it should be read by kids. Please do not let this rating defer you from this cute manga story. The Good: Awesome retro-style artwork, lovable characters, great humor, positive story. The Bad: Some of these tough problems seem to get solved a little too easily. Final Verdict: Deka Kyoshi is a simple, lighthearted, delightful little comic. Read it. This entry was posted on Monday, October 26th, 2009 at 1:19 pm by Scott	.